As photographers specializing in Mexico destination weddings, we have a lot of beach photos! Couples getting married in Mexico - whether Los Cabos, Riviera Maya, Tulum or in this case Sayulita - always want to have a photo that incorporates the ocean and the sand. 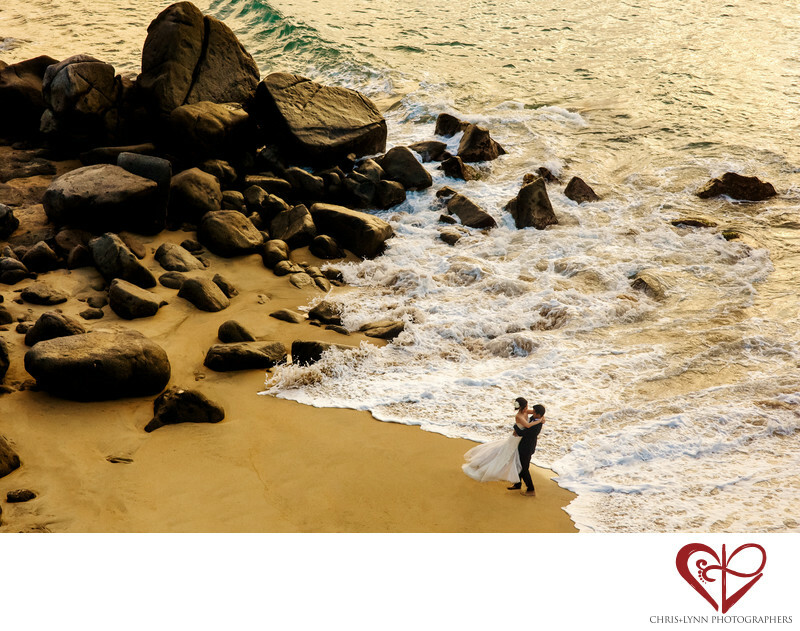 After all, a beautiful and romantic beach setting is one of the main reasons couples choose Mexico for their destination! As artists, our challenge is to make beach photos unique. One way to do this to get a different perspective. For this photo, Chris was balanced on a wall edge high above the shoreline to get a birds-eye view of the couple walking - and spinning - in the sand. The combination of the dramatic rocks, the rush of the water, the golden sunset, and the movement of the bride's skirt as her husband twirls her around make this one of our favorite environmental portraits. Teitiare Estate is one of our favorite private villas for destination weddings in Mexico due to its unique cliff-top views over the Pacific Ocean, its bold color and tropical contemporary style, its private beaches inaccessible to the general public, and magical reception location in the oceanfront palm grove. To view this couple's complete wedding day at Teitare Estate, please see their Featured Wedding here. Location: Teitare Estate, Calle Norte 200, Camino a La Playa Escondida, 63732 Sayulita, Nay., Mexico. 1/1600; f/5.6; ISO 800; 85.0 mm.